Features Andante festivo with Finnish Radio Orchestra, the only existing recording with Sibelius conducting his own music. Double digipak with full colour 52 page booklet, liner notes in English and Finnish, numerous photos including several previously unreleased ones. Superlative performances by the finest Sibelius conductor around - exciting, searching, reflective, and excellently played. The year 2015 will mark a special 150th anniversary of Sibelius' birth. 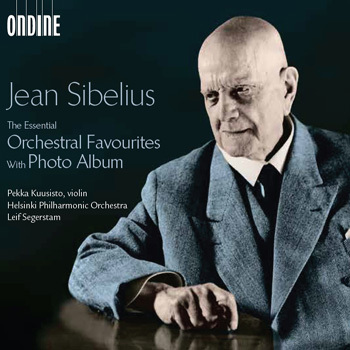 Ondine takes an early step to celebrate this occasion by releasing a special anniversary release Jean Sibelius: The Essential Orchestral Favourites. The new compilation is an updated and expanded version of ODE 1037-2 released in 2003. The collection has now been expanded to two CDs, to include two maybe the most favourite masterpieces from the composer: the Violin Concerto and the 2nd Symphony. As a special feature the 52-page photo album of the new edition includes several photos of Sibelius by the photographer Bertil Dahlgren which have not been released until now. The collection includes the only surviving recording of Sibelius conducting his own music: Andante festivo recorded on the New Year's Day 1939 with the Finnish Radio Orchestra, a performance which was broadcasted live also to the United States. All the other works in this collection are by the Helsinki Philharmonic Orchestra conducted by Leif Segerstam. The soloist in the Violin Concerto is Pekka Kuusisto.